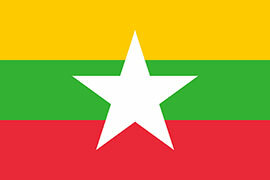 The Republic of the Union of Myanmar is a founding member of ICIMOD, along with seven other member states. Myanmar has been a partner of ICIMOD since its inception and has been helping to meet its major objectives of poverty alleviation and environmental conservation in the Hindu Kush Himalayas. Myanmar contributes core support to ICIMOD, with the Ministry of Natural Resources and Environmental Conservation (MoNREC) as nodal agency, and the Forest Department as designated focal point. The incumbent Director General, Forest Department, formally represents Myanmar in the ICIMOD Board of Governors. Myanmar and ICIMOD are working in the area of enhancing the resilience to climate change and other changes in vulnerable communities through support to livelihood improvement and diversification, and to related capacity building and institutional strengthening. , internships, research and demonstration, and regional and international workshops and conferences, among other activities. ICIMOD`s partner institutions in Myanmar include government agencies, development agencies, academic and research institutions, universities, NGOs and private sector. Early in 2015, ICIMOD has successfully established an ICIMOD Myanmar Country Desk Office in the MoNREC, the nodal Ministry in Myanmar. The establishment of the ICIMOD Country Desk at the MoNREC would give an opportunity for the activities of ICIMOD’s partners in Myanmar to have an increased ownership and visibility as well as to expand partnerships. The concept of a Myanmar Country Desk is to have a focal point of contact for coordination of the activities with various stakeholders in Myanmar as the ICIMOD activities are increasing. Establishing a Country Desk will help to provide overall facilitation and logistical support and serve as one window system for all matters related to ICIMOD programmatic works in Myanmar. The Desk will also act as communication and outreach of ICIMOD to other stakeholders in Myanmar for increased visibility and potential diversification of ICIMOD programmes. Furthermore, it is felt that a Country Desk helps to enhance Myanmar-ICIMOD collaboration given the changing context and increasing interests from various development partners. In addition, it would complement the efforts to diversify the ICIMOD programmes and establish partnerships with other government Ministries and Departments keeping in view with the national development priorities of the Government of Myanmar. ICIMOD, as a regional intergovernmental organisation with a unique mandate, would like to continue to strengthen on-going partnerships and explore new opportunities for partnerships in Myanmar toward sustainable mountain development through knowledge generation and regional cooperation. Partners in this category support development and formulation of mountain-specific development strategies, policies and legislation. These key partners include focal ministries, national and regional organizations, and global partners, and the partnerships are usually formalized through a MoU. This category includes operational partners and research partners. They support regional programme implementation either individually in the RMCs, or through the consortium of partners, usually formalized through a LoA with financial obligations. This category includes universities and academic institutions; regional and global network organizations; science partners and thematic networks; institutions engaged in advocacy, outreach, knowledge sharing and exchange and dissemination including media organizations and publication houses.